After three installments on the Sony PlayStation, Capcom's biggest franchise of the 32-bit generation had wrung all it could out of the console and was ready to move on to more powerful hardware. Released for the Sega Dreamcast in February 2000--not six months after the release of Resident Evil 3: Nemesis--Resident Evil Code: Veronica was, despite the lack of any number in the title, the fourth main installment in the series. After a year of exclusivity to the doomed Sega console, it then gained wider exposure on the PlayStation 2 as Code: Veronica X, which added a few minutes of real-time cut scenes to the story. Code: Veronica X was then later ported to the Nintendo GameCube in 2003, and that was the version that I played. Code: Veronica took advantage of the power of the Dreamcast to generate backgrounds in real time for the first time in series history. While noteworthy as a technical achievement, the new backgrounds were honestly not that big a deal. They were more dynamic but not as sharp as the pre-rendered stages in RE3, which was one of the PS1's best-looking titles. The cameras, their positions still fixed, would sometimes swivel a little as characters moved across the stage, but the process was entirely out of the player's control, and instant cuts to obscure angles were still the norm. What the environments really allowed for was real-time cut scenes with far more sophisticated camerawork. Along those lines, what really impressed at the time of Code: Veronica's debut was the new character graphics. A huge step up from the smeared, static and expressionless faces of the 32-bit days, Code: Veronica followed Namco's Soulcalibur as one of the first games to offer decent-looking character models that bear some resemblance to what we are still working with today. The zombies were the best part. While they had perhaps looked decayed and ugly enough on the PS1, they now had more realistic flesh and more fluid animation, making the semblance of life all the more chilling in these undead. Even a year after its debut on the Dreamcast, the visuals still held up well next to early PS2 fare like Onimusha. Three years later on the GameCube, it of course looked like garbage compared to the RE1 remake, but, hey, not even that game featured real-time environments. Still much the same since the first game, the Code: Veronica gameplay actually even took a few steps back from RE3. While the 180-degree turn was thankfully here to stay, players would have to go back to making do without Jill's more advanced dodge and roll maneuvers. Developed concurrently with RE3, this was a return to a slower-paced and purer survival horror experience. Also much more straightforward than RE2, there was only one scenario in Code: Veronica, and the delivery was completely linear. 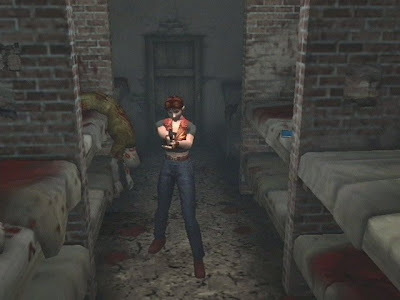 For the first half, the player would control Claire Redfield, still searching for her brother Chris, who would then take over on the second disc. With a playing time of 15-20 hours, it was the longest Resident Evil yet, as well as the most densely plotted. The first three titles had featured typical George Romero-inspired B-movie zombie scripts, but Code: Veronica greatly expanded the original concept, taking the series to new and outrageous Japanese video game territory. Although zombies were still the most common enemy, they had surprisingly little relevance to the plot, which now featured intelligent superhuman villains, a boss fight on board a mid-flight plane, an Antarctic excursion, a rifle-wielding psycho in drag, and the queen of the ants. 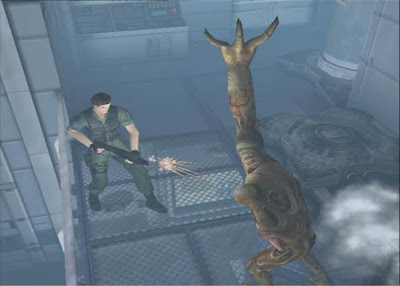 The gameplay was still survival horror, but, beginning to lean more toward Jean-Pierre Jeunet's Alien: Resurrection than Ridley Scott's Alien, the story emphasized action, which was what those aforementioned real-time cut scenes mostly delivered. For many following the series, this was where you either felt it jumped the shark or you became a fan for life. The new attitude was reflected in the characters as well. In the first Resident Evil, Chris was just a generic-looking white guy. His blandness ironically made him a more sympathetic character in the context of survival horror, because it was easy to project your own feelings of fear onto him. But evidently Capcom did not want a disposable random space marine or World War II guy as the leading man of its biggest game. Chris and Claire both were now bona fide action heroes. While they could not so much as walk while aiming during gameplay, they would pull off impossible stunts in the cut scenes. To give evil a face, they even brought back Albert Wesker. Just a shady guy wearing shades in the first game, he now had the moves and manner of an agent out of The Matrix. They had all started with simple designs and the bare minimum for personality, but these were now franchise characters and one of the main reasons for fans to continue following the series. Code: Veronica was the second new Resident Evil release in under six months, the fourth in five years. With RE3, many players had already begun to criticize the lack of innovation or even reform in this series that some considered blatantly flawed to begin with. Perhaps they would be distracted by the slick Dreamcast production and polish on Code: Veronica, but it was essentially still the same game. But the thrill-laden adventure, the biggest ever, was as genuinely captivating as it was endearingly wacky. While the mechanics were old, the experience was still solid, and the story set the series in a new direction, giving followers a reason to keep coming back to Resident Evil. Plus, it had gaming's greatest sad sack, Steve Burnside. Just a few months after the release of the Resident Evil remake, Capcom released Resident Evil Zero for the Nintendo GameCube in 2002. Some anticipated this as the first original Resident Evil release for the GameCube, but expectations may have been unrealistically high, considering that the project was actually initially unveiled in 2000 as in development for the Nintendo 64. The transition to a new hardware generation had delayed the game's development and release, but the concepts were clearly old. Comparing the final release against the original N64 trailer, the difference was just as astounding as between the RE1 remake and the PS1 original. Graphically, RE0 was a perfect stylistic match with the remake, and it was technically even slightly superior. Instead of just using still images, RE0 mixed some animated movie files into the backgrounds to great effect. The opening train level provided the most visually stunning pre-rendered backdrop yet, as characters progressed inside, outside, and even on top of the moving locomotive. The rest of the game would not equal that opening sequence, but later environments would take the series back to the moody vibe of the first game's mansion. RE0 was the only primary entry to not star Chris, Jill, Claire, or Leon. The protagonists were Rebecca Chambers, a supporting character from the first game, and Billy Coen, previously mentioned in a report filed by Rebecca in the N64 version of Resident Evil 2. Whereas the first two installments had provided separate scenarios for each of the selectable protagonists, the key mechanic of RE0 was the "partner zapping" system that allowed the player to control both characters throughout the game. This was about the only new addition to the survival horror formula of previous installments, but it had a more significant impact on the experience than might have been expected. Rebecca and Billy would travel together through most of the adventure. The player could switch between them with the press of a button, and the other character would automatically follow along. Since this was a simple, still fairly low-action game, there wasn't much AI needed. While exploring, your partner could alert you to off-camera enemies, usually by opening fire suddenly. You could not regulate their behavior except by choosing what weapons to give them, but it was easy enough to coordinate your offense with theirs in order to ensure an efficient expenditure of ammo. In lieu of heavier weapons, the two characters could alternate handgun shots to create an almost machine gun-like "wall of fire" effect. The partner zapping also added one new trick to the traditional puzzles. Oftentimes a block or lever-based puzzle would require the use of both characters, either simultaneously or in turn. For example, when facing a locked door, the player might have to fix Billy at a switch that would open the way for Rebecca to walk through. Then, playing as Rebecca on the other side, the player would have to find an alternate means to allow Billy through. These sorts of two-character puzzles were nothing new to gaming as a whole, but they were at least something different for the series. The partner system was most felt in its effect on the tone of the game. With the constant presence of a second gun to back you up, it became a much less oppressive, much less frightening experience. Since the two of them actually depended on one another throughout, the Rebecca-Billy relationship was also a partnership in a much more real sense than the Chris-Jill or Claire-Leon pairings. The story was far less involved than in Code: Veronica, but, just as Resident Evil had always conveyed its horror narrative through artistic framing and atmosphere rather than plot, RE0 developed this relationship between an officer and a fugitive without relying on dialogue. As the two stuck side-by-side and back-to-back through every nightmare, it was almost Ico-like in the way that each gave the other hope in this hopeless situation. It's a shame that Capcom has yet to revisit either of these characters since. 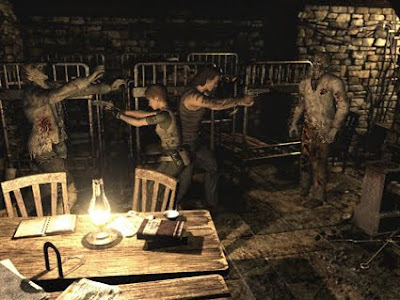 RE0 was perhaps less frightening also because of its less imposing lineup of enemies, which supplemented the usual zombies with a variety of infected animals. The grotesque Hunters and Lickers of the earlier games were replaced by some rabid monkeys, which probably were no more deadly than they had already been pre-infection. The one panic-inducing foe was the leech man, somewhat taking the place of Mr. X or Nemesis as the persistent terror. Upon entering certain rooms, audio cues--discordant tones and the sickening noise of the leeches clustering into man form--would alert the player to the presence but not the precise location of a leech man in the room. These guys were fast and highly resistant to conventional weapons. The only really effective means of dealing with them was to set them on fire with Molotov cocktails, a new and somewhat awkward thrown weapon that existed almost solely for this purpose. The only other major change to the Resident Evil formula was the abandonment of the linked item boxes. Instead, players were now allowed to drop items on the floor, to be picked up from the same spot later if necessary. This saved you the trouble of having to backtrack to an item box if your inventory became too full to pick up a new key item, but it also made it harder to hoard herbs and ammo, since you could not expect them to be magically transported to the nearest box. For the most part, the system worked. RE0's progression had you revisiting areas more frequently than in Nemesis or Code: Veronica, so there was never too great an agony over having to leave a particular item behind forever. As a prequel to the first game, RE0's story offered some enlightening glimpses at the events that led up to that nefarious mansion incident. 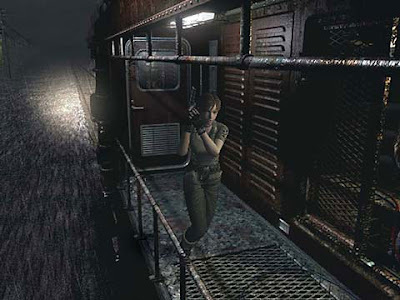 The two games fit together somewhat as RE2 and RE3 had, but RE0 was less engaging overall, since it did not really progress the story further beyond what players already knew. Clearly meant to be played after RE1, so as not to blow any of the twists in the first game, it was also highly revisionist in its additions to the increasingly convoluted mythology. Players introduced to the series with the RE1 remake would have found this a good followup, while diehard veterans would have found that the partner system added something new. It was a good game, perhaps the most polished in the series. But it was also the fifth Resident Evil (sixth if you included the remake) running on the same often criticized mechanics, and there was little denying that the series was due for a change.